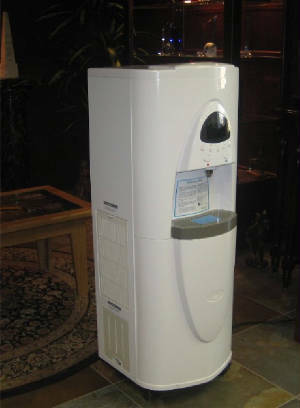 PLANET WATER IS GLOBAL WHOLESALE ATMOSPHERIC WATER GENERATOR SOULTIONS DIVISION OF WBN INC.
AND CLEARING HOUSE TO THE PUBLIC. PROF. JAMES VAGARASOTO OF W.B.N.INC. 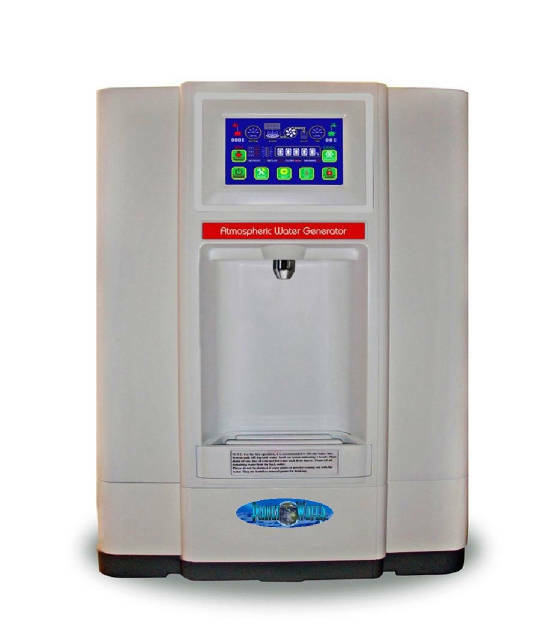 HAS DESIGNED THE MOST TECHNOLOGICALLY ADVANCED ATMOSPHERIC WATER GENERATOR SYSTEMS CALLED WATER PRECIPITATION GENERATORS, WITH ULTRA PURE WATER DELIVERY SYSTEMS FOR THE HOME, OFFICE, COMMERICAL OR INDUSTRIAL SYSTEMS TO 109,000 GALLONS A DAY. 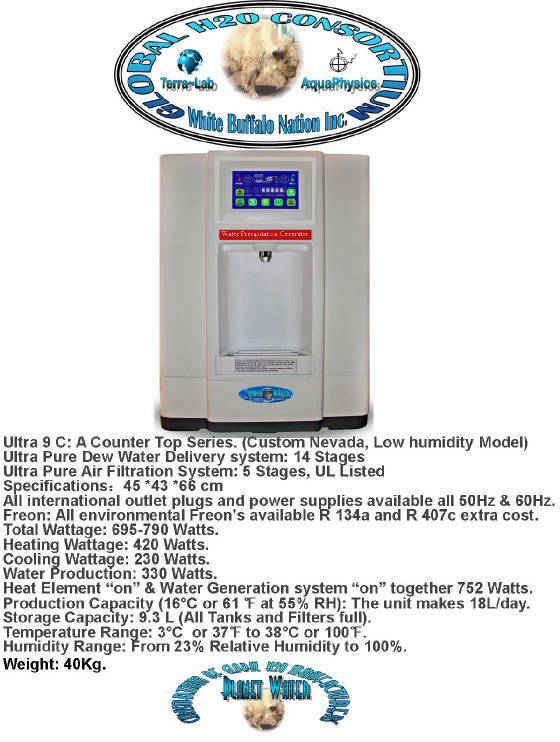 ULTRA ATMOSPHERIC WATER GENERATORS ARE GREEN ENVIRONMENTALLY SAFE AIR TO PURE WATER DELIVERY SOLUTIONS. 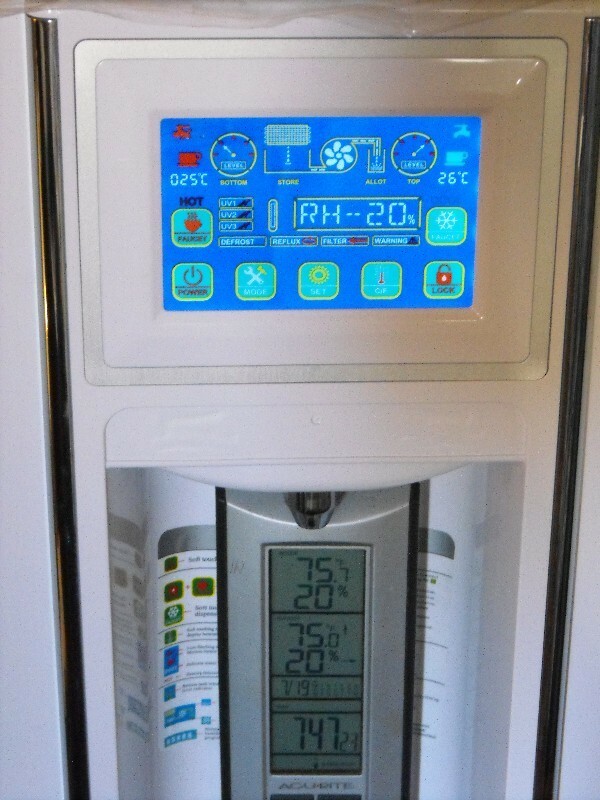 ADVANCED ATMOSPHERIC WATER GENERATOR TECHNOLOGY WITH DIGITAL TOUCH SCREEN CONTROLS THE ULTRA SERIES FROM THE CONSORTIUM AND PLANET WATER DELIVER OVER 40 LITERS A DAY WITH ADVANCED DIGITAL TOUCH SCREEN CONTROLS . Atmospheric Water generator clearing house. Movies coming soon! A première to the USA public. see this wrongly called an atmospheric water generator which is really a systemized tropospheric water precipitation process called a Water Precipitation Generator unit in action making water under 35% percent relative humidity in northern Sierra Nevada mountains, 4828 feet up. On a Totally solar plateau called Crescent Valley, Nevada. where the main Consortium solar bottling facility is currently located. Also UltraPure, UltraPure SilverWater and UltraGold water bottling facilities in the United States also at Purific Water in Miami, Florida. UltraPure Water bottling in Cleveland, Ohio, V.V.I. in Lompoc, Hydrospheric Systems in Fresno, California and Life force Water, In Tempe, Arizona. I will use this web presence to provide the most up-to-date news and information on Air to Water technology globally available about Atmospheric water generators. Think of this web site as a kind of portal, giving Global customers the greenest solutions for atmospheric water generation systems. I hope you'll find all the information you need on this site for the Hybrid Air to Water solutions we offer, and custom service solutions for water and energy technology. We look forward to working with you. CLICK HERE TO EMAIL US AT PLANET WATER H2O CONSORTIUM. The O-carbon-laser turbine large scale power platforms are totally green with zero carbon emissions. Our home and office laser turbine generator is 5 kw and perfect For running your water generator and have power for the house or office totally Green.These are O-C-Energy systems, laser power generators in developement.